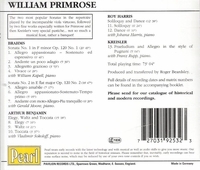 "William Primrose was to the viola what Heifetz was to the violin….Think of Tertis as a Rolls Royce and Primrose as a Ferrari. This nimbleness of left and right hand made him Jascha Heifetz’s favorite alto-clef partner in chamber music and Mozart’s Sinfonia Concertante." "William Primrose was not the first viola virtuoso of the 20th Century, but he was certainly the best known. Born in Glasgow, he trained and performed as a violinist until switching instruments in 1926….His early experience as a violinist undoubtedly influenced his approach to the viola and recalls the great violinists of his generation: his sound was bright, his manner was high-strung, and he tossed off anything put before him with apparent ease and grace. What could this man not do?"